The two men were later released by police without charges. After two men were arrested at a Center City Starbucks for trespassing because they didn't buy anything, many people were upset and angered. A demonstration has been planned for Sunday outside the Starbucks at 18th and Spruce streets where the incident took place. After two men were seen in social media video being handcuffed and removed by police officers from a Philadelphia Starbucks Thursday, the coffee chain issued a public apology and the city's mayor called the incident an example of " what racial discrimination looks like in 2018." 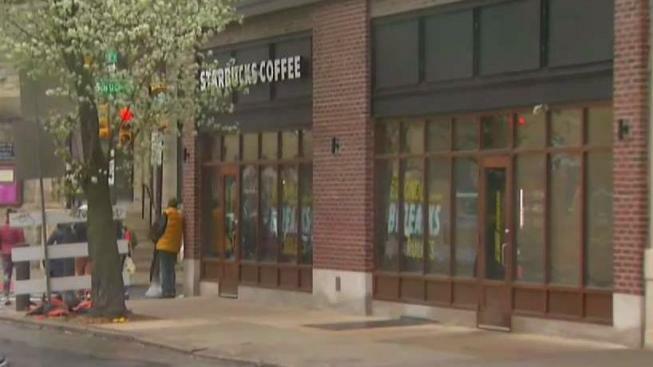 Authorities were called to the store in Center City when the two men allegedly remained in the Starbucks after a manager told them they had to order something, according to the witnesses inside the Starbucks at 18th and Spruce streets. Five to seven police officers arrived about 4:30 p.m. and arrested the two men. Video of the encounter shows the two men calm as they are surrounded by officers, who ask them to stand before handcuffing them and leading them out of the store. Witnesses inside the store could be heard asking what the men did that would lead the officers to arrest them. "I’m black and it was just so, I was scared for them," witness Michelle Saahene told NBC10. "I was so angry I was trembling. I was furious. I even approached the manager. ... I asked the barista why she called the cops on them." Saahene said both men were minding their own business using their phones and sitting quietly. She said she was told that the store manager called police. "The officers said the manager asked them to leave and that if they did not leave the cafe, they would be trespassing," Saahene said. "The two young men politely asked why they were being asked to leave and were not given a reason other than that they hadn’t bought something." Another officer came in and told the men again they had to leave immediately, according to Saahene. Saahene said more officers were called to the Starbucks and one of the men offered to call the friend they were waiting for to prove their story. The officers then made the men stand up and handcuffed them, according to Saahene. By Saturday afternoon, Commissioner Richard Ross took to Facebook Live and defended his officers' actions. He said the men refused to leave the store after a few requests by the responding officers. "Creating an environment that is both safe and welcoming for everyone is paramount for every store," Johnson wrote. "Regretfully, our practices and training led to a bad outcome—the basis for the call to the Philadelphia police department was wrong," he said, adding that the company has a "long-standing commitment to treating one another with respect and dignity." A Starbucks spokesman Reggie Borges had previously said that it is company policy for Starbucks stores in Philadelphia, and in many other cities, to require anyone who wishes to use the facilities, including the bathrooms and sitting areas, to purchase something. Saturday afternoon, Mayor Jim Kenney released a statement on the incident, saying, "I am heartbroken to see Philadelphia in the headlines for an incident that -- at least based on what we know at this point -- appears to exemplify what racial discrimination looks like in 2018." While Kenney acknowledged Starbucks' apology, he also wrote that it wasn't enough. "I have asked the Philadelphia Commission on Human Relations to examine the firm’s policies and procedures, including the extent of, or need for, implicit bias training for its employees," he wrote. "We are reaching out to Starbucks to begin a discussion about this." Kenney also wrote that Commissioner Ross promised to review their policies in regards to the incident. "I believe a thorough review is fully warranted given the unfortunate outcome of this event, particularly at a time when our criminal justice reform efforts are focused on avoiding needless incarcerations," he wrote. Protesters gathered outside the Starbucks Saturday.